Indian Comics Industry has long been under scrutiny. From Comic Con events to speeches at schools, we were asked by lots of fans that when lot of international companies have their own superheroes universe, when is TBS Planet Comics coming out with one of its own? And it is a pleasure for us to now announce that TBS Planet Comics already has started building its own universe. So far we have launched the characters – Ved, Varun, Karma, Raat, Yug, Takshak and Uttara. And we are about to launch Rudra this week! And that’s not all – we will be introducing some very interesting characters in coming months! Ved is a Delhi based detective who uses his wit and intellect to solve cases. Brought up by magician Anand, he is a ventriloquist and an illusionist. The character is truly Indian in nature and was among #1 bestseller on Amazon in Indian comics category. After Mahabharat times, when Dwarka got submerged, a new species started under water. One of the babies came afloat who was Lord Varun’s incarnation. Watch out for adventures of this water based superhuman. 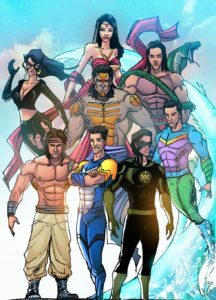 Varun series is Indian comics series inspired from mythology but based in modern fantasy. What goes around comes around – is the law of Karma. One of the most intriguing characters of our comics superhero universe. Karma punishes criminal to the extent of crime. For eg. if you steal something from someone, he will steal something from you and make you realize the mistake. An immortal warrior. He had been saved by King of Devpur during a war for a mission. The mission of uprooting evil from the planet. Based in thousands of years ago, this superhero of the past has some interesting adventures. Son of Vayu. Blessing of Shiva. Rudra is among the most fierce and powerful characters of TBS Planet Comics Universe. As Veer, he works as a tourist guide in Haridwar. The water-princess. Daughter of King Mahendra, she is the princess of Haritdweep. Currently a part of Varun’s comic books, she is soon set to make special appearances in other superhero comic books as well. Her secrets were revealed in comic book “Uttara” launched at Comic Con Bangalore 2017. Raat is a vigilante at Bangalore and trying to protect the city from attacking criminals. Under her identity Nisha she has been working at a leading news publication – Canal News. From where can I read these comics ? You can read comics on our Android app available on Google Play Store or alternatively you may purchase it from our store or subscribe to our digital comics feeds.